Taste of the tropics! Exceptional juiciness and a vibrant tropical flavor that balances the tastes of sweet and tart. 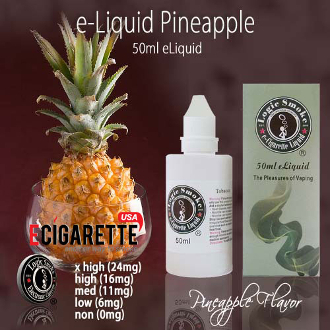 Logic Smoke Pineapple flavored e-liquid tastes like the real thing. Sweet pineapple flavor that is great by itself or mixed with a variety of our other tropical flavors. Mix with flavors such as mango, coconut, orange, apple or whatever suits your tastes. Make your own fruit punch flavor! Mix 2 parts pineapple, with 1 part mango and one part orange for a fabulous fruity burst of flavor. With the perfect blend of an 80/20 PG/VG mix (propylene glycol and vegetable glycerin: organic, food grade preservative compounds), you'll get the best flavor concentration along with the perfect amount of vapor to satisfy your vaping needs.